What It’s About: Irving Rosenfeld (Christian Bale) runs a chain of dry cleaners…and a side business where he cons people out of their money. He meets, falls in love with, and recruits Sydney Prosser (Amy Adams) into his con game. The only source of conflict in their life is Irving’s batty wife Rosalyn (Jennifer Lawrence) until FBI agent Richie DiMaso (Bradley Cooper) busts the pair. He agrees to give them immunity if they help him nab some other con men, but the job quickly snowballs as DiMaso pursues corruption conviction on politicians, including the Mayor of Camden, New Jersey, Carmine Polito (Jeremy Renner). Why Watch it Today? : The crew first meet with Mayor Polito on this date in 1978. 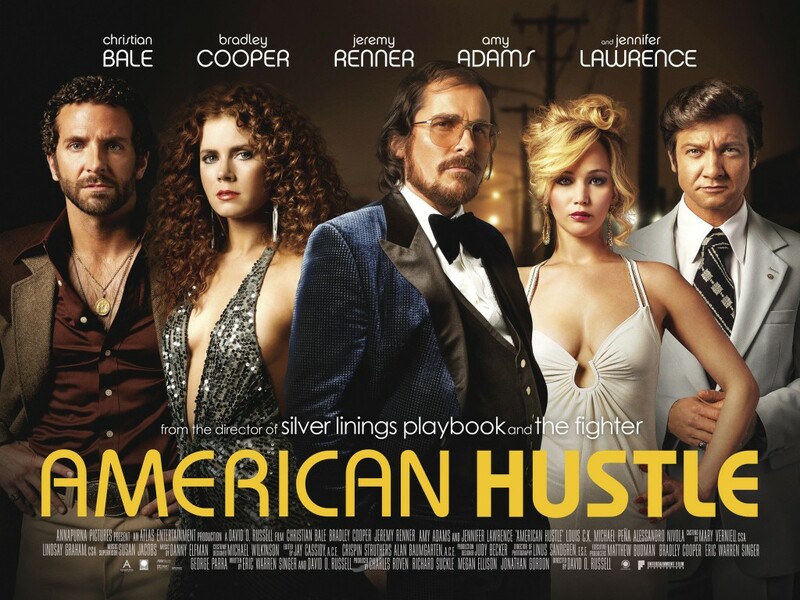 David O. Russell’s American Hustle is a fun romp that was nominated for ten Oscars but won none of them. In the end that may be fitting for this enjoyable but ultimately slight tale of cons and corruption (the moral seems to be Federal government=bad, local mobbed up corrupt politicians and small time con men=good) loaded with great actors and loving detail of terrible 70s sartorial choices. This entry was posted in "Based on a True Story", Adaptation, Con, Crime, Drama, Movie of the Day, Period Film, True Crime and tagged 1970s, Abscam, adultery, Amy Adams, Anthony Zerbe, Atlantic City, Best Actor Nominee, Best Actress Nominee, Best Costume Design Nominee, Best Director Nominee, Best Film Editing Nominee, Best Original Screenplay Nominee, Best Picture Nominee, Best Production Design Nominee, Best Supporting Actor Nominee, Best Supporting Actress Nominee, Camden, Christian Bale, Colleen Camp, Columbia Pictures, con, con artist, Danny Elfman, disco, double cross, dry cleaner, FBI, homage, informant, insanity, it's not over, Jack Huston, Jennifer Lawrence, Jeremy Renner, Long Island, Louis C. K., Mafia, New Jersey, New York City, overbearing mother, Robert De Niro, twist.